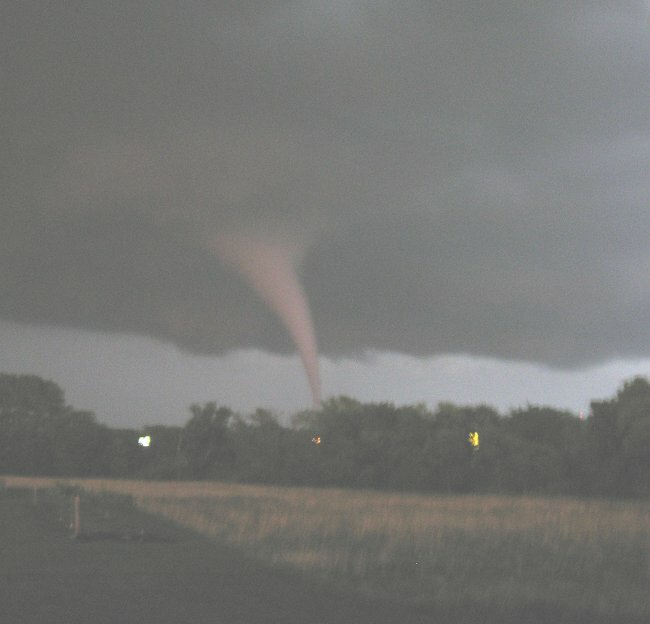 Midwestern residents are approaching the two-year anniversary of the Reading, Kan., tornado (shown here) and the Joplin, Mo., twister. Ashley Bollinger photo. The 2013 tornado season has been quiet. To date, there have been fewer than 220 tornadoes of EF-1 strength or greater nationwide this year. In Kansas, there have been four twisters through May 10. Four. And those were weak. It’s the slowest start to a tornado season in 15 years across America. Another example: Iowa will likely pass its record for most days between tornadoes this week (record: 355. Current: 355). So with a month left before temperatures across the Central Plains stay in the 90s, humidities match and the cold fronts go away, it would be tempting to think we might escape with minimal damage. Spring has been late. I mean, we’ve had a wintry mix in May, forcing orchards to start fires to keep their trees from the dangers of a hard freeze. In May, mind you. Not March. But there’s a month left in the tornado season. Lord knows what could happen. Last year’s tornado season hit early and hit hard around east central Kansas when Harveyville was hit by a rapid spin-up twister in late February. The EF-2 was on the ground for barely five minutes, but in a case of wrong place, wrong time, Harveyville took a direct hit. From there, the severe weather season lost a lot of its punch across the Central Plains, although a host of twisters developed across central Kansas in mid-April. 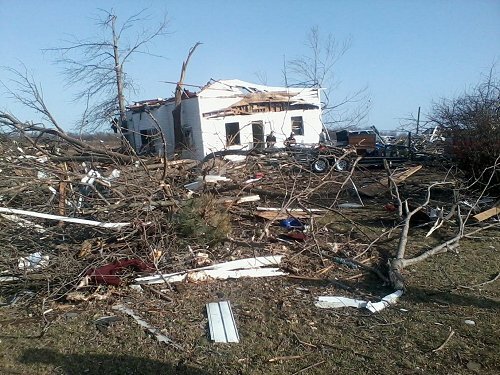 Harveyville, Kan., was hit in 2012 by one of the earliest tornadoes for a calendar year in Kansas history. Chuck Samples photo. Two years ago was different. There was the Dixie Outbreak, which blasted the previously “untouchable” Super Outbreak record of tornado touchdowns in April. Reading, Kan., made national headlines for a deadly tornado in mid-May…only to see Joplin nailed by one of the worst twisters in American history less than 20 hours later. Omaha, Neb., marked the 38th anniversary of its big one earlier this month, the F-5 demon which tore through the center of town. Emporia, Kan., will mark 39 years since an F-4 sliced off the west edge of the city next month. I guess all this indicates that here in the Midwest, it doesn’t matter how much time is left in the tornado season. In some cases, like Harveyville, it really doesn’t matter if you are officially in twister season. If the conditions are right, you head for shelter (or you head for work if you’re in radio news). If Mother Nature has taught us anything, though, it’s that lengthy periods of quiet can end with shattering speed. With the Storm Prediction Center indicating a good severe weather possibility this weekend, our sleepy tornado season could roar to life. There’s a month left — officially– in the 2013 tornado season. Hope you haven’t been lulled to sleep. 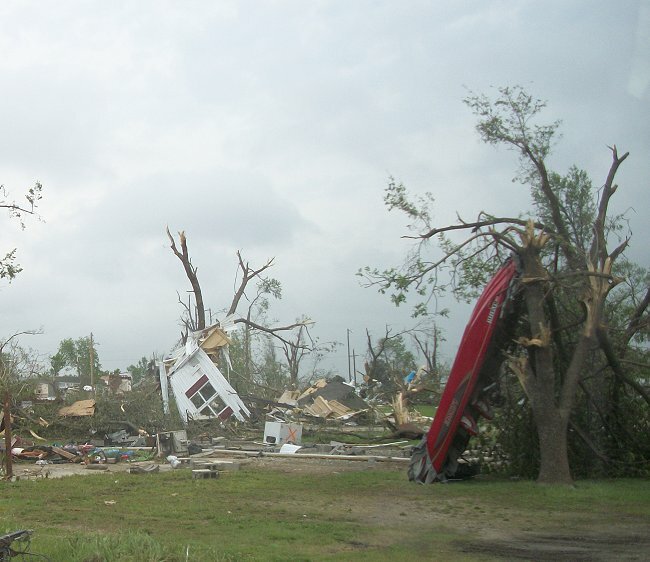 The extent of damage after the EF-3 tornado that Reading, Kan., in 2011 was sobering and widespread. Chuck Samples photo. By day (and often by night), I'm the news director for a small-market cluster of family-owned radio stations. I'm blessed to have a great wife and four amazing children. I enjoy music, writing, a variety of sports, stormchasing and...believe it or not...naptime. Just a 20 something year old wanting to be heard.